Before we get into the details as to how to choose a wok and which woks you should check out, let us first discuss the different pros and cons of using a carbon steel wok. 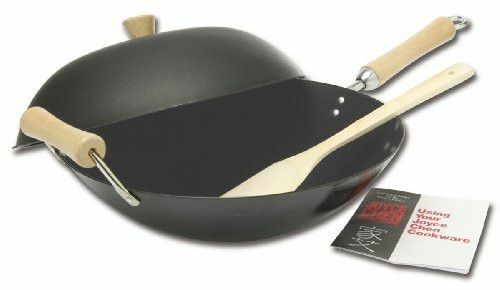 When it comes to the benefits of this product, I have noticed that carbon steel woks are very versatile and affordable. You can easily get a piece for less than 30 bucks. This is the cooking material to get if you are on a tight budget. Another great thing about carbon steel woks is that they are very lightweight. This is an essential feature in my opinion because I have always found it hard to lift a wok with one hand, especially when it’s full of food. 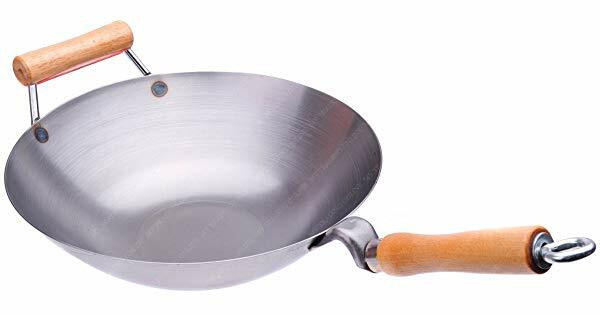 If you have issues with your hands such as arthritis or you have chronic pains that you deal with everyday, a good, lightweight wok will make your life easier. There’s also this thing called “wok-hei” or “breath-of-the-wok.” This refers to the supposed air getting built up inside the wok that helps enhance the flavor of the ingredients being cooked in it. This is one of the reasons why the wok has been a favorite choice in Asian countries. This is also the reason why foods cooked in a wok are chock-full of flavors. Carbon steel woks are also quite durable. With proper maintenance, you can make your carbon steel wok last for years. The key to becoming a happy and satisfied customer is being familiar with a set of factors that you can use as a guide for determining whether a certain product meets your personal needs and preferences or not. 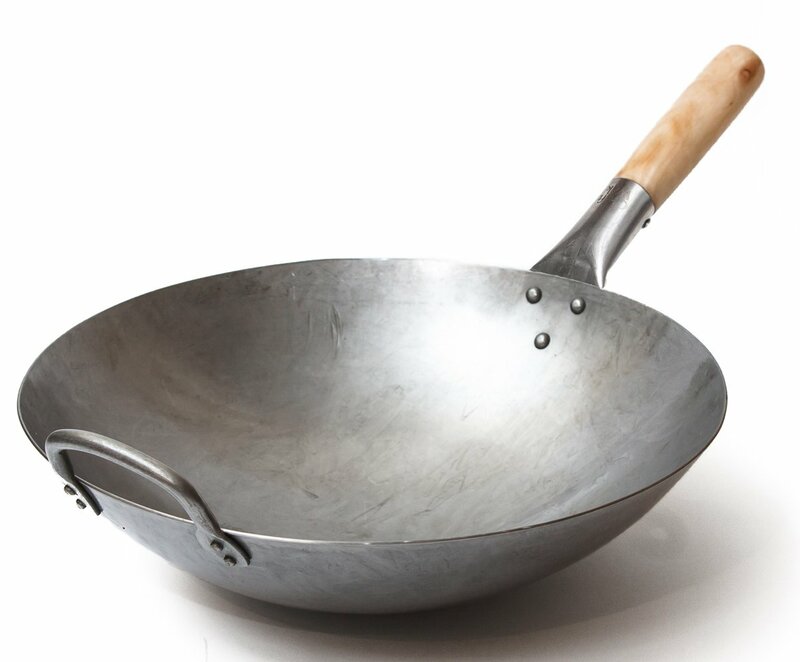 Today, you will be able to find woks made out of multiple materials including carbon steel, stainless steel, teflon, cast iron, and more. The type of material that a wok is made of can significantly affect the cooking experience you will get upon using the wok. One of the best types of woks in the market today are made out of carbon steel. Carbon steel woks tend to retain heat very well, be really sturdy, lightweight and doesn’t come with coatings that can easily get chipped off. Try to choose a wok that is neither too deep nor too shallow. I highly recommend getting one that comes with a depth of 4-inches and a diameter of 14-inches for the best cooking experience. Woks often come with round bottoms, making them somewhat incompatible with most stovetops. This is why another thing that you’d want to look for when it comes to shape is a flat bottom. This is true especially if you are using a glass top stove. Since glass top stoves are typically more slippery than gas stovetops, a flatter wok bottom would help the wok to stay on to. Though I personally don’t recommend making a purchase based on the free things that come with the product, it’s always nice to end up with more than what you paid for. If you happen to end up choosing between two products that are somewhat similar in terms of properties, you might as well go with the one that comes with accessories or other freebies such as lids, spatulas, steamer trays, burner rings, ladles, etc. Just make sure the accessories that come with the wok are durable as well. You don’t want to buy flimsy accessories that you will just throw away because they didn’t last long. Woks are pretty large kitchen tools. A wok can be quite difficult to lift when designed poorly. 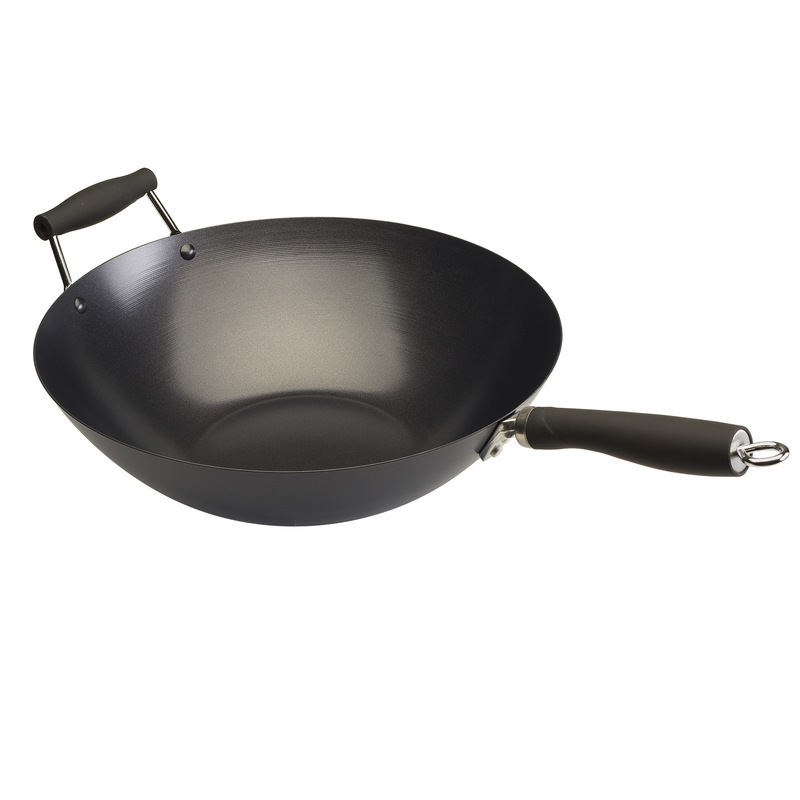 For added ease of use, try to choose a wok that comes with multiple handles that are comfortable to grip. Doing so will ensure that you will get to toss the ingredients in the wok without much difficulty even when it’s full of heavy ingredients. The last thing you would want to consider when it comes to choosing woks is the ease of cleaning and maintenance. Try to choose a wok that you can clean in a dishwasher or one that comes with a non-stick coating for easy cleaning. Since you will be doing a lot of frying on your wok, you don’t want the ingredients to stick on the surface. Most people resort to using a steel brush to clean their wok, which can be damaging, which is why nonstick properties would be ideal. Now let's take a look at our detailed review below. This traditional hand hammered carbon steel pow wok is a great choice for anyone who would like to cook small to medium sized meals. This wok comes with a 15-inch gauge and is made out of very sturdy carbon steel that will last you years. What’s great about this wok is its ergonomics. It comes with a steel helper handle that stays cool to the touch despite being placed over high heat. This carbon steel wok comes with a very versatile design that allows it to be used on different kinds of stovetops. It comes with a flat bottom, enabling you to stably placed it on any stove top including grills and electric ones. Another great thing about this product is its ergonomics. This carbon steel wok comes with a wooden side pool handle that makes for easy maneuvering even when it’s completely full of heavy ingredients. Needless to say, this product will let you cook like a real pro with its well-designed build. This carbon steel wok is probably the easiest one to clean in this list. What makes this wok easy to clean is its completely non-stick coating that also happens to be completely PFOA free. Aside from being easy to clean, its size makes it perfect for cooking large meals. It can even be used for deep frying. Another great feature of this wok is that it comes with a flat base that will allow you to use it on different kinds of stovetops. You can even place it directly on the burner for maximum heat. This carbon steel wok works with gas, ceramic, and electric stovetops. It also comes with a handy lifetime warranty. This uncoated carbon steel wok is one of the prettiest products listed in this article. This carbon steel wok comes with a medium sized 14-inch diameter that makes it ideal for cooking medium sized meals. It’s also designed with a flat bottom for added versatility, making it useful on both electric and gas stovetops. Another great thing about this carbon steel wok is that it is highly ergonomic. 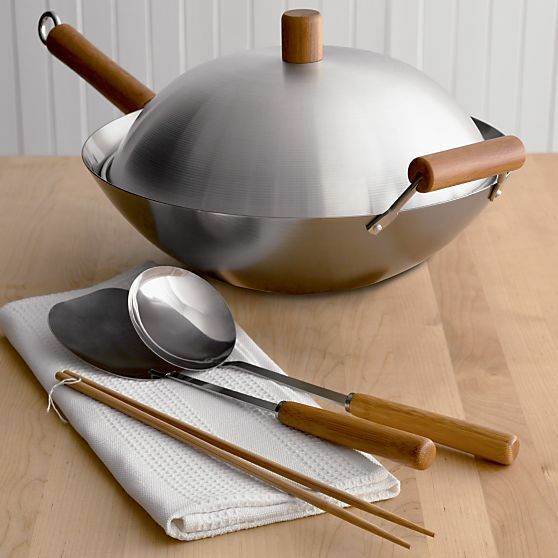 It comes with multiple handles that will make tossing the food inside the wok as easy as pie. Its ergonomic phenolic handles also stay cool to the touch even when placed in high heat. This product is also very easy to store since it comes with a loop handle. Another medium-sized carbon steel wok in this list is the Sur La Table professional. This carbon steel wok is ideal for frying, boiling, braising, and deep frying all sorts of ingredients since it comes with a 14-inch diameter. This carbon steel wok is also highly versatile. Even though it doesn’t come with a flat bottom, it is still compatible with several kinds of stovetops including ceramic, induction, electrical, and gas. What’s more is that it doesn’t even have to be seasoned before use. 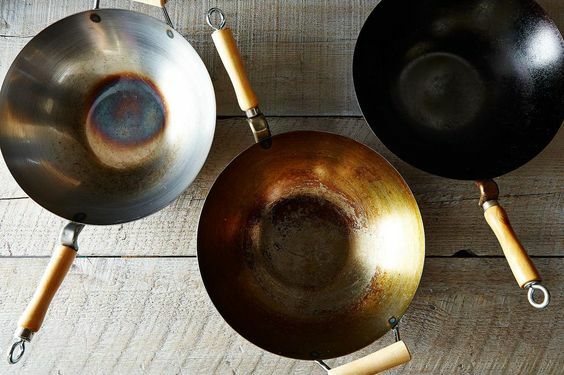 All of these woks are winners in my book so whatever you choose, you’re bound to have a wok that will work for your needs for many more years to come. But at the end of the day, it still boils down to personal preferences. What might work for you might not work for other people. We all have different cooking skills, levels and preferences, after all. But to make it easier to find the wok that suits you perfectly, I’ll make a recommendation. The Craft Wok Traditional Hand Hammered Carbon Steel Pow Wok is great for everyone – professional or amateur home cooks alike. It is a great choice for families with small to medium-sized cooking needs only so if you often cook for a larger crowd or you own a restaurant and you need a wok, you probably need to look for something bigger. Otherwise, this won’t fail you. Professional cooks will like the versatility and the sturdy design of the M.V Trading 14 Inches Carbon Steel Wok with Helper Handle. It works on different types of stovetops. But even if you only need a wok for home cooking, you will still find this ideal. 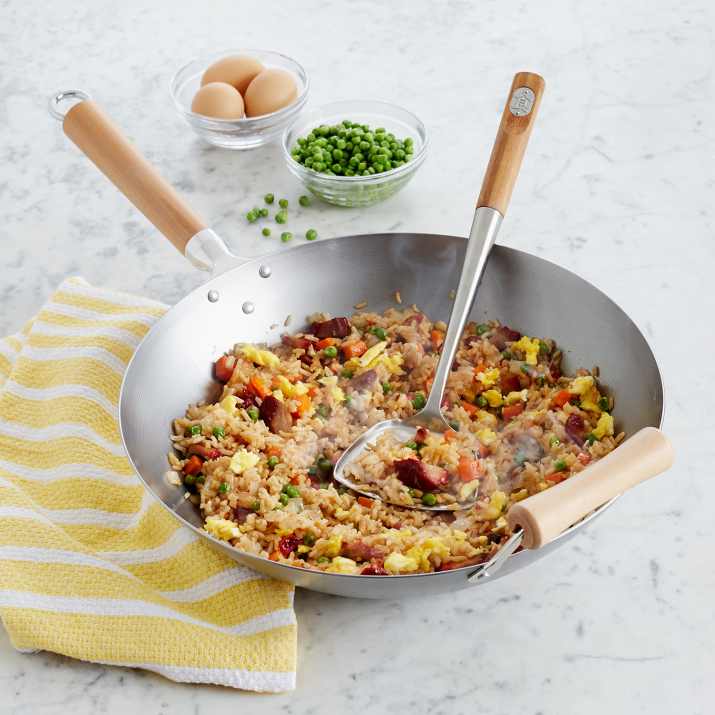 Ecolution Non-Stick Carbon Steel Wok is great for people who don’t like high-maintenance and fussy woks. This wouldn’t take a lot of time or effort to clean so you won’t be stressed-out using it for your various cooking needs. If you often cook sticky foods, this is a great buy. It is also large, great for deep-frying and for cooking large portions of meals. If aesthetics is important to you, the Joyce Chen 22-0060 Pro Chef Flat Bottom Wok is a great option. It looks great, so it should be no issue if you have no storage space and you just leave your wok displayed on your countertop. The Sur La Table Professional Carbon Steel Wok is also ideal for medium cooking needs. You can use this for just about any cooking need such as braising, boiling or frying. 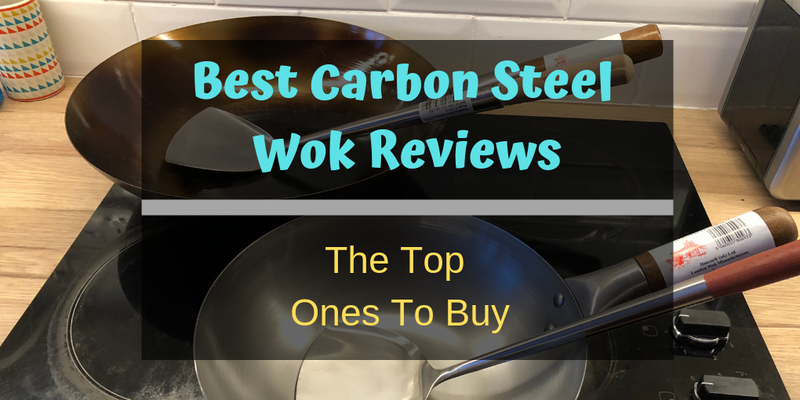 Of all the different types of pans we looked at, we found out that Craft Wok Traditional Hand Hammered Carbon Steel Pow Wok is the best carbon steel wok to buy. Give these suggestions a go. If you still want to look for more home cooking equipment and tools, you can check out our homepage for more product reviews and suggestions. If you have any questions about the article above, please do not be shy to leave us a comment in the box below.